It’s now four years since the earthquakes that devastated my hometown of Christchurch/Otautahi (its Maori name). It’s still a picture of destruction. What a lot of people don’t understand is that the earthquakes continue. There was one while I was there – a short, sharp jolt that rattled the door knocker and my nerves. 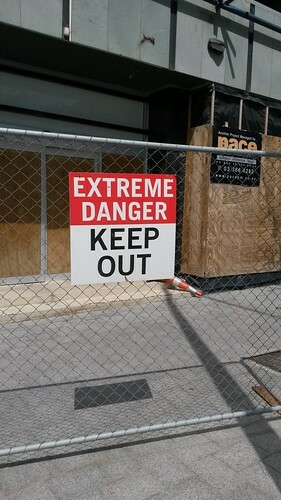 The people of Christchurch are a resilient bunch but you get a sense of the post-traumatic stress they must be living with. This building is still up but nearly every window is broken. 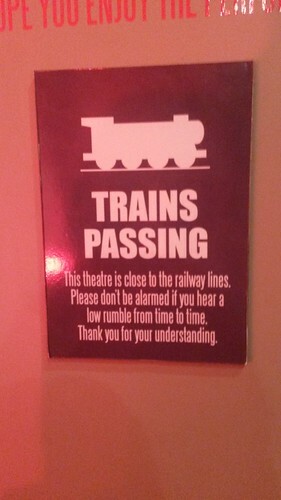 You often hear an earthquake coming before you feel it – hence a warning like this one in the Court Theatre is a wise idea. People can still feel a bit uneasy about being confined to an inside space. 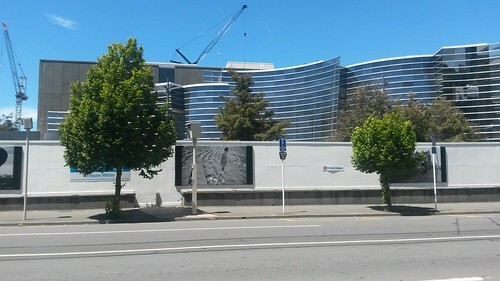 The theatre moved from the neo-Gothic Arts Centre (where Mum was when the February quake hit) to a warehouse in a previously unfashionable part of town. 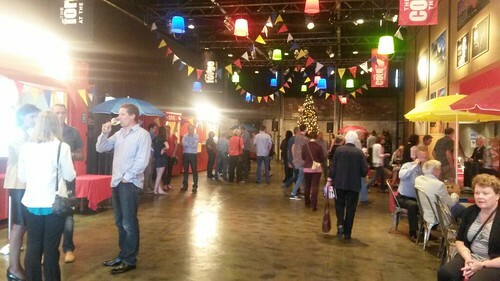 It’s a fantastic space. The Art Gallery was the Civil Defence command centre in the aftermath of the disaster. It still hasn’t reopened to the public. 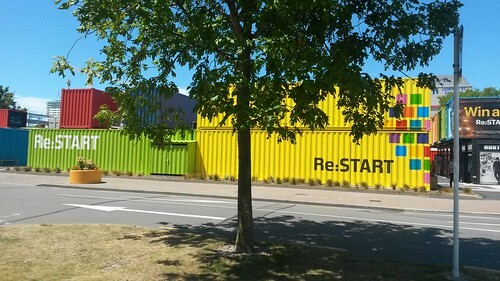 Almost all of the shops are gone in the central city so, inspired by Boxpark in Shoreditch, the Re:START mall was born. 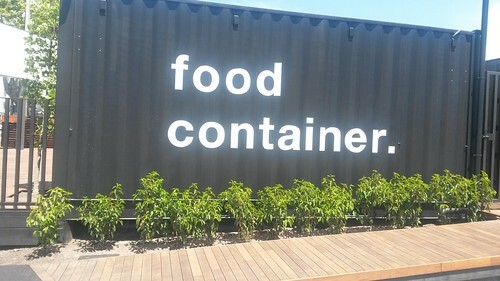 Containers are useful for all sorts of things. This one wasn’t open yet so I couldn’t check it out. Digger mountain. The country shuts down for three weeks over Christmas, so I didn’t see much demo/building action. The central city only recently reopened fully, but signs like this abound. There are signs of life in this flattened town. My brother and sister-in-law used to live in a loft apartment here, when they were first living together. 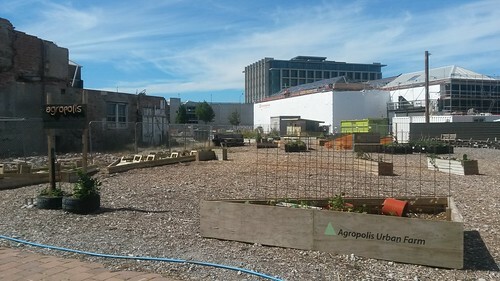 Now it’s a community garden. 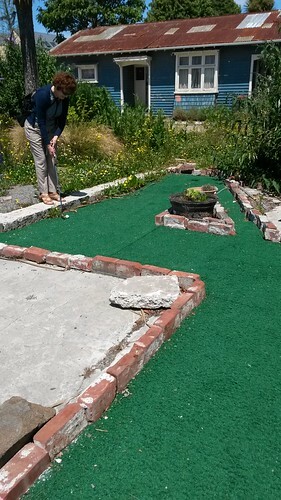 You can borrow golf clubs from the library (relocated from its demolished former home) and play six holes of mini golf dotted on demolition sites around the central city. 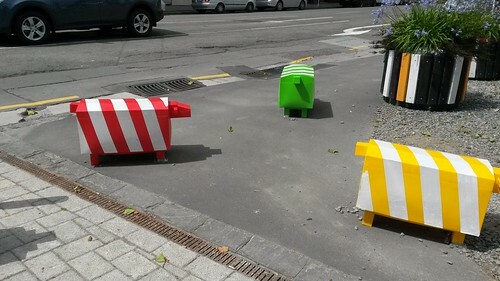 Construction sheep. There’s some great public art around the place. I’ve saved my favourite thing for last. 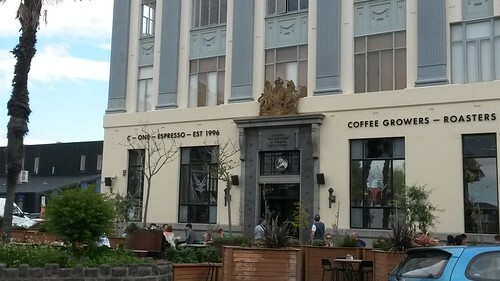 C1 Espresso is a Christchurch institution, where all the cool kids used to get their caffeine fix. 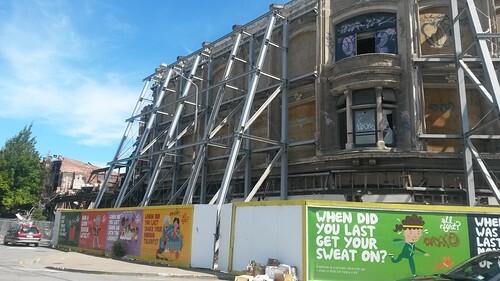 It used to be under my brother and sister-in-law’s apartment, but has now relocated across the road to the former home of another institution, arthouse video store Alice in Videoland. 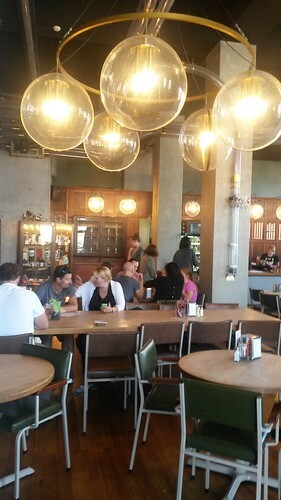 Alice’s (as it is affectionately known) has moved to the back of the premises and also opened a small cinema. 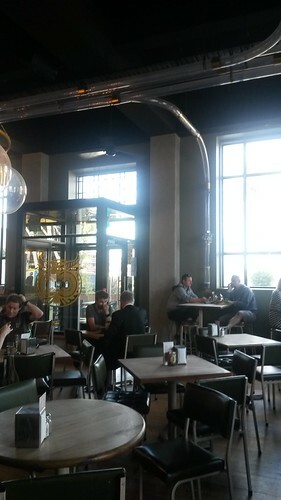 They have left plenty of space for the cafe though. Inside, lights salvaged from somewhere. 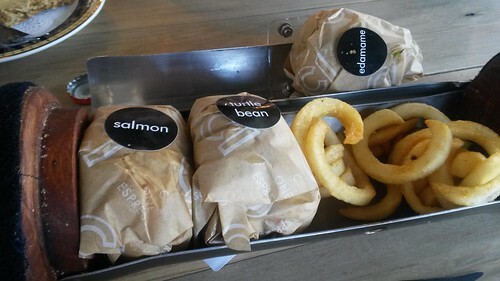 The new cafe’s USP though is their “pneumatic sliders”. 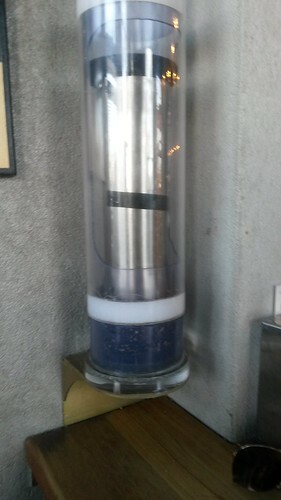 Remember how department stores used to have pneumatic tubes to whizz orders and cash through the building? Well at C1 they do the same but with food. The tubes crisscross the room. You choose three sliders from the impressive range on offer, then wait…not too long, because those babies travel at 100km/h. Before coming to rest at your table. These were seriously good, my friends. 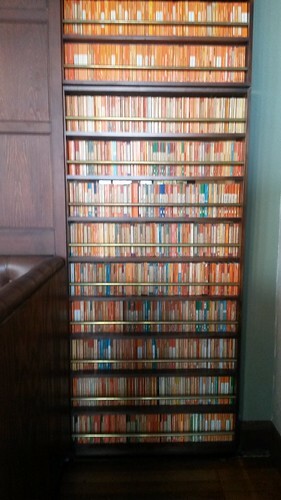 Other cool things about C1: you get to the loos via a sliding bookcase full of Penguin books. Once you get there, a Harry Potter audiobook plays in the background. 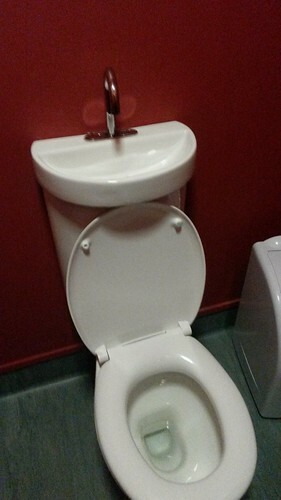 And the toilets recycle grey water from the sinks! I just about died from the cool. I could go into more detail – the upshot is the picture’s not all bleak. All sorts of things are springing up. 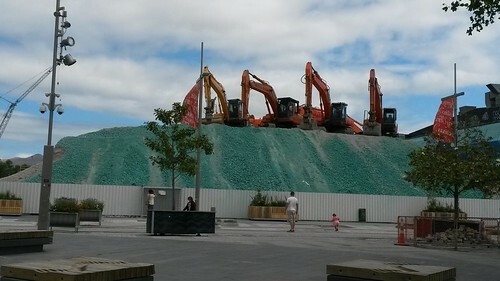 I can really recommend a visit to Christchurch to anyone with the slightest bit of curiosity. It’s going to take a long time to rebuild and I don’t know if the people realise quite how long. London still has a gap-toothed grin from the Second World War – and we’ve only just gotten back to the pre-war head count. The London comparison doesn’t stop there. I thought it had a real East London vibe – and not just from the Boxpark connection. 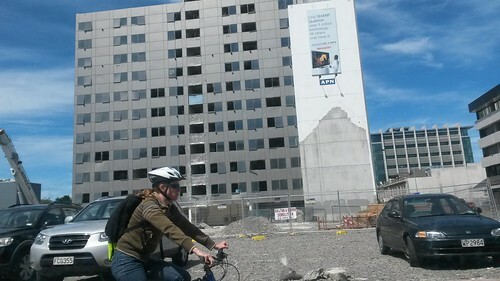 But Christchurch is constantly changing and this is a good chance to reinvent itself. It’s going to be an exciting place to be. Happy New Year friends. It’s a while since I’ve blogged but I have been busy! 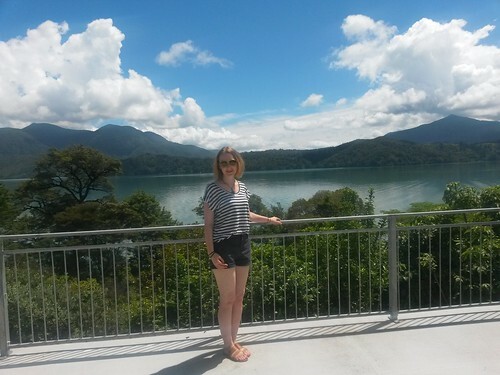 I spent Christmas in New Zealand with my family, and started a new job after I got back. I thought I would share a few pictures of my time in the sun. I caught up with an old friend of mine who was back from Japan for Christmas. 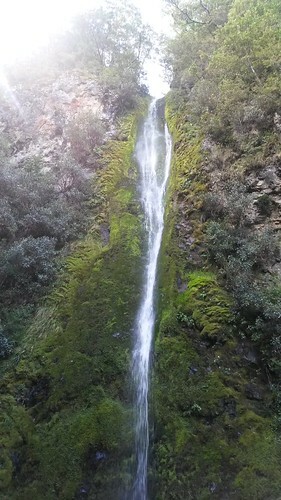 We went to Hanmer Springs, walked to a waterfall and then soaked in the thermal pools. 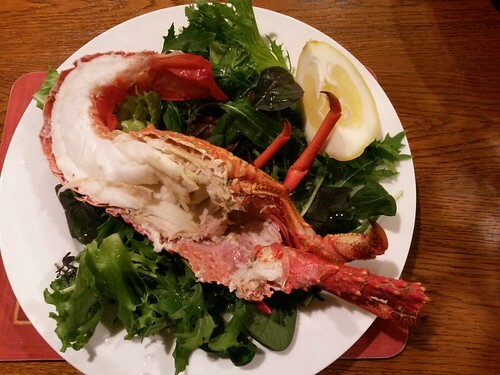 Ate Kaikoura crayfish (rock lobster). You buy them in a little shack on the side of the road. 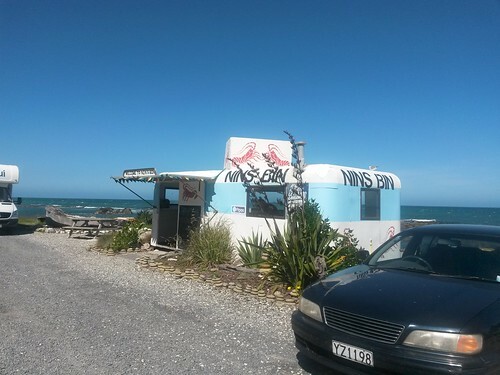 Nin’s Bin is the best-known crayfish shack. 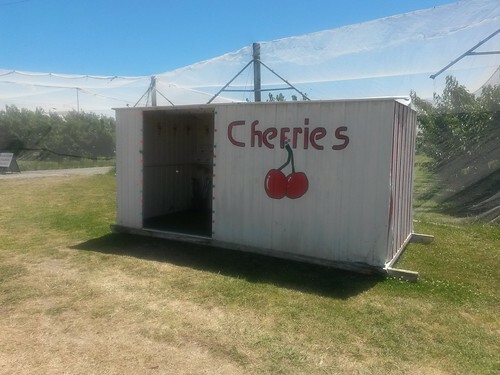 Side-of-the-road cherries. Cherries are obligatory at Christmas time. 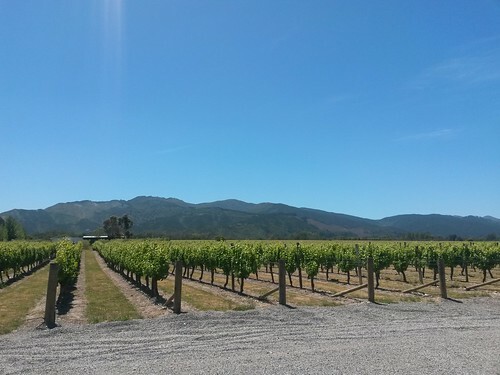 I always get a vineyard lunch in while I’m there. 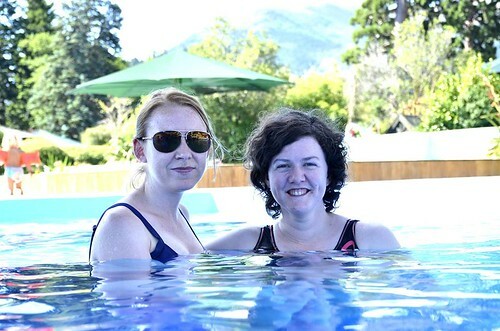 We spent a few days at our beach house in the Marlborough Sounds. 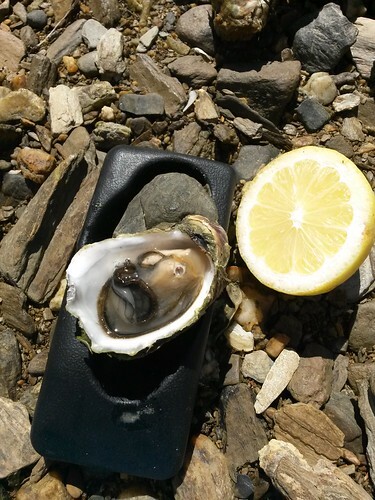 Trying out my new oyster knife on the beach. It’s the best way to have oysters – you throw the shells back in so new oysters can grow on them. Lemons grow in abundance in the Sounds – the climate is Mediterranean. The oysters are Pacific oysters and taste incredible. At low tide you can eat your fill. 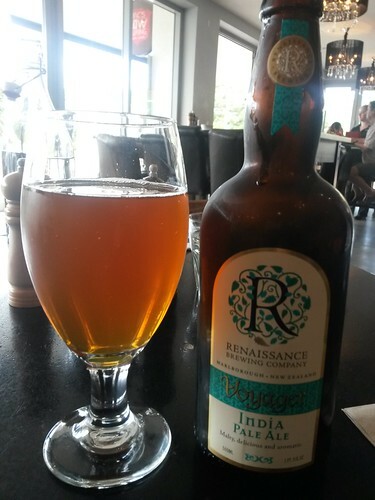 Local ale – New Zealand has finally developed a craft beer culture. I love a good Kiwi brunch. 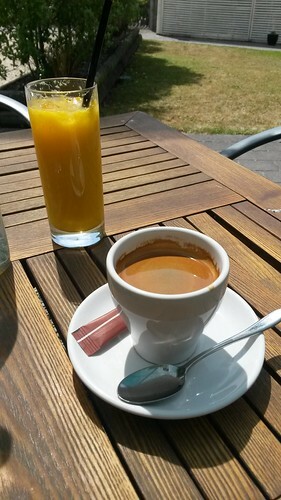 And I drank a lot of long blacks. Thankfully this is catching on in London like the flat white did before it. 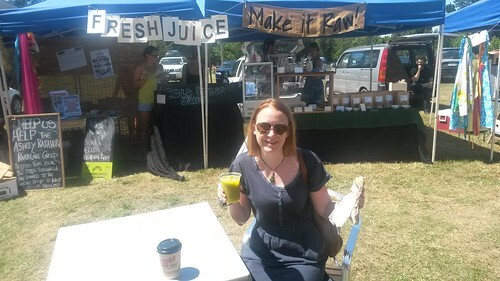 A green juice at the farmers’ market. 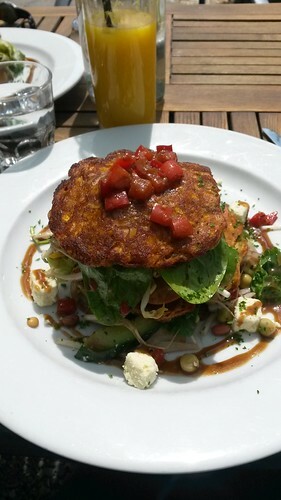 This one was in the countryside, on a Friday, and packed with ladies who lunch. 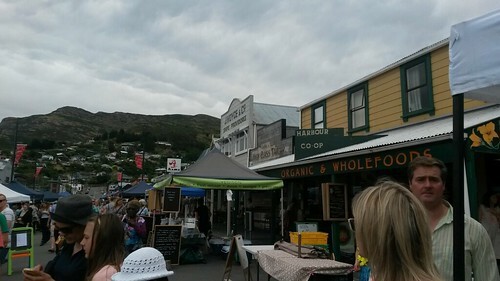 Another market, this time in the port town of Lyttelton.